Friedrich Ebsen had a striking biography. He was a member of the Schleswig-Holstein brotherhood of deacons in a home for disabled people in Rickling from 1914 to 1920. After that he worked for the christian National Mission. From 1928 he worked in Rickling on the educational staff. When he left the management attested that he was capable of training and dealing with the often very difficult people in his charge. After this he worked with the Marines until October 1942. According to information he supplied himself he then got orders from SS-officials to work at the concentration camp Oranienburg. Two weeks later he spent a short time at the concentration camp Buchenwald and was then sent to the concentration camp Flossenburg. After helping to clear up after the Hamburg bombings he started work at Neuengamme in February 1943. 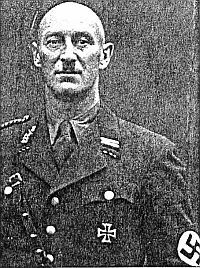 Following a short transfer to the concentration camp Wittenberge he took command of the concentration camp Schandelah.